Baskin-Robbins Ice Cream franchise for sale. Free Baskin-Robbins Ice Cream franchise information. 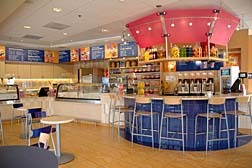 The Baskin-Robbins franchise opportunity offers rewarding potential. Consider the pleasure of being in business for yourself but not by yourself: the security of joining an innovative network with more than 60 years of QSR and franchising experience, the power of one of the world's most admired and recognized organizations. 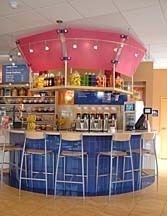 Come and see what franchising with Baskin-Robbins is all about. We're constantly working on the next great flavor, the next great frosty beverage, the next great treat, all to continue delighting our customers. And despite already having over 5,000 global stores with over 2,700 in the <?XML:NAMESPACE PREFIX = ST1 />United States, we continually open new franchises as we strive to be America's Favorite Ice Cream store. But just how much innovation is necessary in the ice cream business? Our never-ending focus on fun combined with our commitment to innovation and a quality customer experience is important when you're considering investing in a business. We have over 98% brand awareness and over 80% of people living in the United States have eaten Baskin-Robbins. We've been voted the #1 Choice in Treats Chains by Restaurants & Institutions 13 of the last 17 years. And we're currently ranked #10 by Entrepreneur Magazine (the #1 ice cream brand) on its 2004 Top Franchise List. We are a recognized leader in the ice cream industry, and we're interested in talking to people who share our commitment. Team player and leader - People who work well with others, openly share and participate, and want to contribute to Baskin-Robbins overall success, but who also understand the importance of day-to-day business operations including finance, marketing, and more. People person - A prospective franchisee must thoroughly enjoy interacting with the public, possess strong problem solving skills and truly understand the importance of providing exceptional customer service. Enthusiastic - People who exhibit a high level of enthusiasm and are self-motivated. To learn more about the Baskin-Robbins Ice Cream franchise opportunity, simply complete the form below.